Colonial BancGroup Inc.'s second-quarter loss widened on big charges and a key financing deal fell through, pushing the company out of compliance with Alabama capital requirements and causing doubts about the company's ability to remain a going concern. In June, the Colonial Bank unit agreed to oversight by the Federal Deposit Insurance Corp. and Alabama Banking Department and to other steps ... a $26 billion institution. As a result of the above described regulatory actions and the current uncertainties associated with Colonial’s ability to increase its capital levels to meet regulatory requirements, management has concluded that there is substantial doubt about Colonial’s ability to continue as a going concern. The Company expects to update its 2008 financial statements contained in the Company’s Annual Report on Form 10-K, prior to filing its June 30, 2009 Form 10-Q. The Company is working to implement the Capital Action Plan described above which includes strategies to increase capital or to sell the Company in order to address the uncertainties giving rise to the going concern assessment. As of July 16, 2009, Mutual Bank had total assets of $1.6 billion and total deposits of approximately $1.6 billion. The FDIC estimates that the cost to the Deposit Insurance Fund (DIF) will be $696 million. ... Mutual Bank is the 69th FDIC-insured institution to fail in the nation this year, and the thirteenth in Illinois. The last FDIC-insured institution to be closed in the state was First National Bank of Danville, Danville, on July 2, 2009. As of June 19, 2009, First State Bank of Altus had total assets of $103.4 million and deposits of approximately $98.2 million. In addition assuming all of the deposits of the failed bank, Herring Bank will purchase approximately $64.4 million in assets. The FDIC will retain the remaining assets for later disposition. The FDIC estimates that the cost to the Deposit Insurance Fund (DIF) will be $25.2 million.... First State Bank of Altus is the 65th FDIC-insured institution to fail in the nation this year, and the first in Oklahoma. The last FDIC-insured institution to be closed in the state was American Bank of Commerce, Oklahoma City, on March 26, 1992. The FDIC estimates that the cost to the Deposit Insurance Fund (DIF) will be $46 million. ... Integrity Bank is the 66th FDIC-insured institution to fail in the nation this year, and the fourth in Florida. The last FDIC-insured institution to be closed in the state was BankUnited, FSB, Coral Gables, on May 21, 2009. The FDIC estimates that the cost to the Deposit Insurance Fund (DIF) will be $129.5 million. ... Peoples Community Bank is the 67th FDIC-insured institution to fail in the nation this year, and the first in Ohio. The last FDIC-insured institution to be closed in the state was Miami Valley Bank, Lakeview, October 4, 2007. The FDIC estimates that the cost to the Deposit Insurance Fund (DIF) will be $15 million. ... First BankAmericano is the 68th FDIC-insured institution to fail in the nation this year, and the second in New Jersey. The last FDIC-insured institution to be closed in the state was Citizens Community Bank, Ridgewood, May 1, 2009. Tech Ticker has a story on house prices today: Housing Bottom? No, the Mother of All Head Fakes. The house price issue is worth some thought this weekend. Although the seasonal adjustment for Case-Shiller appears insufficient, I checked it with some models, and I think it is calculated correctly. I'll post some thoughts on house prices this weekend. Today, an empty, half-mile-long warehouse lingers from that vision. The building's 1.2 million square feet could fit 193 full-size copies of the Statue of Liberty. Its parking lot has room for 292 tractor trailers. But on a recent morning the only signs of life were a security guard's trailer, golf cart and bicycle. In March, Everett-based Frontier Financial had agreed to submit to tighter supervision by regulators over the way it lends money and manages its operations. Probably a number of weaker banks will be acquired this year. It is better than being seized by the FDIC. And finally from Doug Short of dshort.com (financial planner): "Four Bad Bears". The House of Representatives voted to provide an emergency $2 billion for the “cash for clunkers” program on Friday, and the White House declared the program very much alive, even though car buyers appear to have already snapped up the $1 billion that Congress originally appropriated. The Senate, which will be in session next week, will take up the program then. As of June 30, 2009, Corus’ subsidiary, Corus Bank N.A. (the “Bank”) had preliminary Tier 1 capital of negative $157 million with a ratio of (2.1)%, and preliminary Tier 1 risk-based capital and total risk-based capital of negative $157 million with a ratio of (3.1)%, as reported in its June 30, 2009 Report of Condition and Income (“Call Report”) filed on July 30, 2009. As of June 30, 2009, the Bank was considered “critically undercapitalized” under the regulatory framework for prompt corrective action (“PCA”). Under the FDI Act, depository institutions that are “critically undercapitalized” must be placed into conservatorship or receivership within 90 days of becoming critically undercapitalized, unless the institution’s primary Federal regulatory authority (here, the OCC) and the Federal Deposit Insurance Corporation (“FDIC”) determine and document that “other action” would better achieve the purposes of PCA. At this point in time ... the Company believes that it is highly unlikely that it will be able to obtain additional outside capital that does not include the provision of substantial assistance by the FDIC or other Federal governmental authorities. Federal regulators have escalated the number of wounded banks they have essentially put on probation ... The Federal Reserve and the Office of the Comptroller of the Currency, two of the primary U.S. banking regulators, have issued more of the so-called memorandums of understanding so far this year than they did for all of 2008, according to data obtained from the agencies under Freedom of Information Act requests. At the current rate of at least 285 so far, the Fed, OCC and Federal Deposit Insurance Corp. are on track to issue nearly 600 of the secret agreements for the full year, compared with 399 last year. Memorandums of understanding can force financial institutions to increase their capital, overhaul management or take other major steps. And the FDIC this morning announced twenty-seven cease and desist orders for June. Consider this your preview for BFF. The restaurant industry’s economic challenges continued to persist in June, as the National Restaurant Association’s comprehensive index of restaurant activity declined for the second consecutive month. 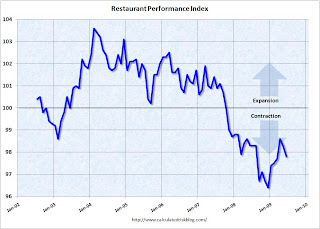 The Association’s Restaurant Performance Index (RPI) – a monthly composite index that tracks the health of and outlook for the U.S. restaurant industry – stood at 97.8 in June, down 0.5 percent from May and its 20th consecutive month below 100. Restaurant operators also reported negative customer traffic levels in June, marking the 22nd consecutive month of traffic declines. The restaurant business is still contracting, and although not contracting as fast as late last year, the pace of contraction has picked up over the last two months. Someone must have eaten the green shoots. Residential investment (RI) has been declining for 14 consecutive quarters, and the decline in Q2 was still very large - a 29.3% annual rate in Q2. This puts RI as a percent of GDP at 2.4%, by far the lowest level since WWII. The second graph shows non-residential investment as a percent of GDP. All areas of investment are declining. 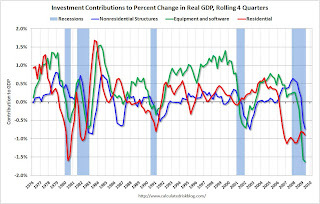 Business investment in equipment and software was off 9.0% (annualized) and has declined for 6 consecutive quarters. Investment in non-residential structures was only off 8.9% (annualized) and will probably fall sharply over the next year or so. 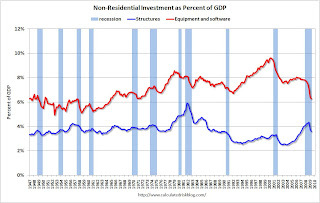 The third graph shows the contribution to GDP from residential investment, equipment and software, and nonresidential structures. The graph shows the rolling 4 quarters for each investment category. Residential investment (red) has been a huge drag on the economy for the last three and a half years. The good news is the drag on GDP will probably end soon. The bad news is any rebound in residential investment will probably be small because of the huge overhang of existing inventory. As expected, nonresidential investment - both structures (blue), and equipment and software (green) - declined in Q2. If there is a surprise it is how well nonresidential investment in structures held up in Q2 (although we could see this in the construction spending data). This investment will decline sharply soon as many major projects are completed, and few new projects are started. In previous downturns the economy recovered long before nonresidential investment in structures recovered - and that will probably be true again this time. 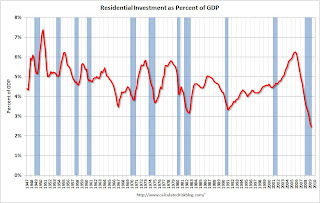 As always, residential investment is the most important investment area to follow - and I expect it to turn slightly positive in the second half of 2009. Real gross domestic product -- the output of goods and services produced by labor and property located in the United States -- decreased at an annual rate of 1.0 percent in the second quarter of 2009, (that is, from the first quarter to the second), according to the "advance" estimate released by the Bureau of Economic Analysis. In the first quarter, real GDP decreased 6.4 percent. Real nonresidential fixed investment decreased 8.9 percent in the second quarter, compared with a decrease of 39.2 percent in the first. Nonresidential structures decreased 8.9 percent, compared with a decrease of 43.6 percent. Equipment and software decreased 9.0 percent, compared with a decrease of 36.4 percent. Real residential fixed investment decreased 29.3 percent, compared with a decrease of 38.2 percent. So PCE decreased (as expected), and the investment slump continued. Exports and government spending were the positives. For the stress tests, the baseline scenario for Q2 was minus 1.2%, and the more adverse scenario was minus 4.3%, so, before revisions, Q2 is tracking close to the baseline scenario. This is the fourth consecutive quarterly decline in GDP; the first time that has happened since the government started keeping quarterly records in 1947. Note: the building is actually in Sunnyvale. California Bavarian Corp.’s Bordeaux Centre has been sold at auction to its lender Wrightwood Capital for less than $15 million. This is another never occupied commercial building - like the ones Jim the Realtor showed us in San Diego last night. The U.S. government will suspend the popular cash-for-clunkers program after less than four days in business, telling Congress that the plan would burn through its $950-million budget by midnight, several sources told the Free Press. ... auto dealers may have already arranged the sale of more than the 250,000 vehicles that federal officials expected the plan to generate. This graph shows the historical light vehicle sales (seasonally adjusted annual rate) from the BEA (blue) and an estimate for June (red, light vehicle sales of 9.69 million SAAR from AutoData Corp). 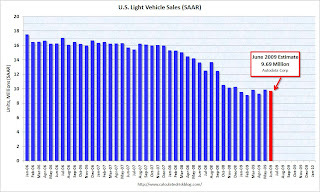 Light vehicle sales last September (before the collapse in October) were at a 12.46 million SAAR. Of course this is just one week of July at that sales rate ... and the program is now suspended. But that means July sales will probably be over 10 million SAAR for the first time this year. The DOL report this morning showed seasonally adjusted insured unemployment at 6.2 million, down from a peak of about 6.9 million. This raises the question (and frequent emails) of how many unemployed workers have exhausted their regular unemployment benefits (Note: most are still receiving extended benefits). 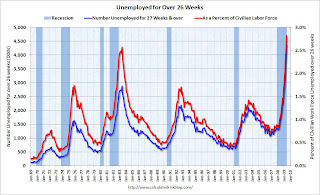 According to the BLS, there are almost 4.4 million workers who have been unemployed for more than 26 weeks (and still want a job). This is 2.8% of the civilian workforce. Notice the peak happens after a recession ends, and the of long term unemployed peaked about 18 months after the end of the last two recessions (because of the jobless recovery). This suggests that even if the current recession officially ended this month, the number of long term unemployed would probably continue to rise through the end of 2010. Victor Vangelakos lives in a luxury condominium tower on the Caloosahatchee River. He never has to worry about the neighbors making too much noise. The dashed line is the closing price today. The S&P 500 is up 45.8% from the bottom (310 points), and still off 37% from the peak (578 points below the max). 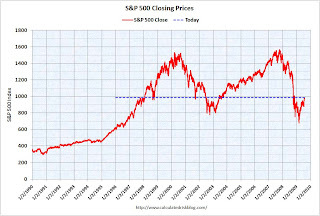 The S&P 500 first hit this level in Feb 1998; over 11 years ago. Hope Now released the Q2 Mortgage Loss Mitigation Statistics today. Most of the data concerns modifications, but here are couple of graphs on delinquencies and foreclosures. 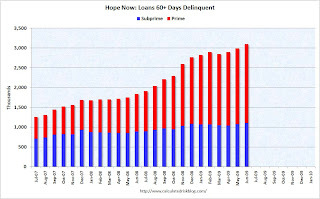 There are now more than 3 million mortgage loans 60+ delinquent based on the Hope Now statistics. This covers approximately 85% of the total industry. There are far more prime loans delinquent than subprime, although a much higher percentage of subprime (18.4%) vs prime (4.24%). 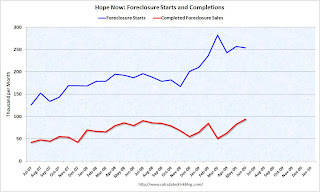 The second graph shows foreclosure starts and completions. Foreclosure starts are above 250 thousand per month, and completions close to 100 thousand per month. There is a lag between start and completion, and a number of loans cure or are modified - but it does appear completions will increase in the 2nd half of 2009 based on the surge in starts at the beginning of the year. ... "My view is that some assets in the senior preferred will have to be left behind as they come out of conservatorship," Federal Housing Finance Agency Director James B. Lockhart said Thursday in response to a question at a panel discussion in Washington. "That will mean that some of the losses will never be repaid." The Treasury has agreed to pump $200 billion into each company in order to keep them solvent. In exchange, the government receives senior preferred stock that pays a 10% dividend. So far, it has injected $85 billion in total into the companies, but Lockhart said that figure was likely to rise in the coming months. Mr. Lockhart said Fannie and Freddie would likely see their reserves continue to decline next year, but could return to strong profits in two to three years. Foresight Analytics estimates that the nation's 8,000 community banks will suffer losses of $60 billion related to commercial real estate in the next two to three years, and that about 713 banks across the country will fail. Under that scenario, about 19 banks in Minnesota will fail and commercial real estate losses could total more than $2 billion. That is more than the rumored (and denied) comment about 500 bank failures attributed to FDIC Chairman Bair. Bank consultant Robert Viering, principal of River Point Group Inc. in Monticello, had that lesson drilled into him when he was a regional credit officer at the former Norwest Bank. A credit manual, circa 1990, warned him and his colleagues: "The pivotal issue in CRE lending is knowing when to stop. Restraint must be initiated by bankers because historically borrowers have been unable to recognize the warning signs. Commercial real estate lending should not be viewed as the cornerstone of a loan portfolio." Absolutely. The CRE developers just go crazy at the end of every boom; restraint must be initiated by bankers. In year-over-year measurements, the industry’s occupancy fell 7.9 percent to end the week at 67.0 percent. Average daily rate dropped 9.1 percent to finish the week at US$98.13. Revenue per available room for the week decreased 16.3 percent to finish at US$65.77. The three week average is off 8.7% from the same period in 2008. The average daily rate is down 9.1%, and RevPAR is off 16.3% from the same week last year. Comments: This is a multi-year slump. 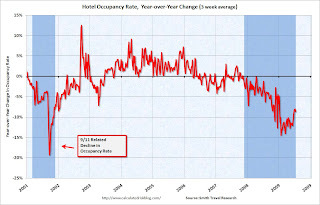 Although the occupancy rate was off 7.9 percent compared to last year, the occupancy rate is off about 12 percent compared to the same week in 2006 and 2007. Also, business travel is off much more than leisure travel - so the summer months are not as weak as other times of the year. September will be the real test for business travel. Note: Earlier this month, the seasonally adjusted weekly claims were distorted by changes in the patterns of auto layoffs this year. That is now over. The advance number for seasonally adjusted insured unemployment during the week ending July 18 was 6,197,000, a decrease of 54,000 from the preceding week's revised level of 6,251,000. The four-week average of weekly unemployment claims decreased this week by 8,250, and is now 99,750 below the peak of 16 weeks ago. It appears that initial weekly claims have peaked for this cycle. The level of initial claims has fallen fairly quickly - but is still very high (over 580K), indicating significant weakness in the job market. Just a reminder ... after earlier recessions (like '81), weekly claims fell quickly, but in the two most recent recessions, weekly claims declined a little and then stayed elevated for some time. 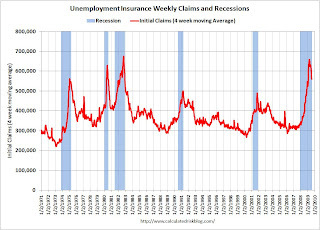 I expect weekly claims to stay elevated following the current recession too. The Federal Deposit Insurance Corp. ... is poised to start breaking failed financial institutions into good and bad pieces in an effort to drum up more interest from prospective buyers. The strategy ... is aimed at selling the most distressed hunks of failed banks to private-equity firms and other types of investors who may be more willing than traditional banks to take a flier on bad assets. The traditional banks could then bid on the deposits, branches and other bits of the failed institution that are appealing. "We want banks to participate in the resolution process, but we know it's a tough time for banks to participate in the resolution process," said Joseph Jiampietro, a senior adviser to FDIC Chairman Sheila Bair. ... "There are certain situations when assets are so distressed and make up a significant percentage of the balance sheet that strategic buyers are hesitant to participate in the process," said Mr. Jiampietro. The article quotes Jiampietro as saying the process is "pretty far along" and that a transaction could happen soon. As I said, think Corus and Guaranty Financial. Both will probably be seized as soon as bidders can be found. This suggests an RTC type entity might also be formed. Interesting times. Last month 16.9 percent of all resales were houses or condos that had been foreclosed on in the prior 12 months, down from 19.2 percent in May and a peak of 23.9 percent in January this year. However, there are more foreclosure resales on the way, and they will continue to weigh on home prices for the foreseeable future. In June, lender repossessions spiked: Nearly 863 houses and condos were lost to foreclosure in the three-county Seattle region, up nearly 37 percent from May and up 119 percent from a year ago. It was the highest monthly total since foreclosures began to surge in 2006. The figures are based on the number of trustees deeds filed with the county recorder's office. For the foreseeable future, the Phoenix region will continue to have many foreclosures to recycle, and that inventory of lender-owned property will weigh on home prices. In June, lender repossessions spiked: Nearly 5,800 houses and condos were lost to foreclosure in the two-county Phoenix region, up nearly 38 percent from May and up 40.8 percent from a year ago. It was the highest monthly total since foreclosures began to surge in 2006. Looking ahead, the Las Vegas region will still have many foreclosures to burn off, and that inventory of distressed property will weigh on home prices. In June, lender repossessions spiked: Nearly 3,600 houses and condos were lost to foreclosure in Clark County, up 54 percent from May and up 34 percent from a year ago. It was the second-highest monthly total, behind 3,718 this February, since foreclosures began to surge in 2006. Las Vegas and Phoenix have far more foreclosure resales than Seattle, but all three cities are seeing a surge in foreclosures. I spoke with a SoCal developer yesterday, and he said there are some positive signs in the California Inland Empire, but he is worried about another flood of REOs. Every bank he has spoken with (he does some consulting for banks on their real estate holdings) is sitting on a pile of REOs and homes in the foreclosure process. It is unclear how big this surge will be, but here it comes. Most of the activity is at the low end, and inventory is pretty low. This is true for many of the low-to-mid end areas. There are more foreclosures coming, but the timing is uncertain - will it be a flood, or will the banks just bleed the foreclosures into the market? But for the mid-to-high end - expect bad news! Not only is financing tight, but there is a dearth of move-up buyers. Cram-downs let federal judges lengthen terms, cut interest rates and reduce mortgage balances of bankrupt homeowners, even if the lender objects. A company affiliated with Corus Bank seized the 216-unit Aventine at Boynton Beach apartment complex. Boynton Pinehurst ... planned to convert Aventine into condos when it took a $37.2 million mortgage from Corus Bank in 2006. It paid $48 million for the property that year. Millworks, a 420,882-square-foot residential/commercial project at De Long and Reichert avenues, had a grand opening in May but has only sold two of 124 condominiums situated above a Whole Foods grocery store slated to open next spring. Starting this week, the condos will be rented on sixth-month and one-year leases for about two years before Signature intends to crank up sales efforts again, Ghielmetti said. The condo reconversions and new condos being rented is part of the reason there has been a surge in rental units in recent years, pushing the rental vacancy rate to record levels. The last graph is from Doug Short of dshort.com (financial planner): "Four Bad Bears". Reports from the 12 Federal Reserve Districts suggest that economic activity continued to be weak going into the summer, but most Districts indicated that the pace of decline has moderated since the last report or that activity has begun to stabilize, albeit at a low level. Most Districts reported sluggish retail activity. Commercial real estate leasing markets were described as either "weak" or "slow" in all 12 Districts, although the severity of the downturn varied somewhat across Districts. While the office vacancy rate was up and rents were down in the Dallas District, market fundamentals there remained stronger than the national average. Market conditions in the New York District are significantly worse than one year ago, on average, but have been relatively stable in recent weeks and some parts of the District report improving fundamentals. Office vacancy rates continued to climb in the Atlanta, Boston, Kansas City, Minneapolis, Philadelphia, Richmond, and San Francisco Districts, as well as in Manhattan, resulting in sizable leasing concessions and/or declines in asking rents. ... Commercial real estate sales volume remained low, even "non-existent" in some Districts, reportedly due to a combination of tight credit and weak demand. Construction activity was limited and/or declining in most Districts, although exceptions were noted for health and institutional construction in the St. Louis District, public sector construction in the Chicago District, and the reconstruction of the World Trade Center in Manhattan. Tight credit was cited as an ongoing factor in the dearth of new construction activity. The commercial real estate outlook was mixed, both within and across Districts. Some contacts expect commercial real estate markets to improve within two quarters and others predict further market deterioration for the remainder of 2009 and possibly through late 2010. Residential real estate markets in most Districts remained weak, but many reported signs of improvement. The Minneapolis and San Francisco Districts cited large increases in home sales compared with 2008 levels, and other Districts reported rising sales in some submarkets. Of the areas that continued to experience year--over--year sales declines, all except St Louis--where sales were down steeply-- also reported that the pace of decline was moderating. In general, the low end of the market, especially entry-level homes, continued to perform relatively well; contacts in the New York, Kansas City, and Dallas Districts attributed this relative strength, at least in part, to the first--time homebuyer tax credit. Condo sales were still far below year--before levels according to the Boston and New York reports. In general, home prices continued to decline in most markets, although a number of Districts saw possible signs of stabilization. The Boston, Atlanta, and Chicago Districts mentioned that the increasing number of foreclosure sales was exerting downward pressure on home prices. Residential construction reportedly remains quite slow, with the Chicago, Cleveland, and Kansas City Districts noting that financing is difficult. It is the usual pattern for Commercial real estate (CRE) to follow residential off the cliff, but I'm surprised anyone thinks CRE will recovery in a couple of quarters. I think CRE will be crushed this year and next. Fed's Dudley: Recovery to be "Lackluster"
From NY Fed President William Dudley: The Economic Outlook and the Fed's Balance Sheet: The Issue of "How" versus "When"
Dudley discussed his economic outlook, and how the Fed will exit from the current policy stance. Dudley doesn't think the Fed's policy stance will change any time soon. [T]he economic contraction appears to be waning and it seems likely that we will see moderate growth in the second half of the year. The economy should be boosted by three factors: 1) a modest recovery in housing activity and motor vehicle sales; 2) the impact of the fiscal stimulus on domestic demand; and 3) a sharp swing in the pace of inventory investment. In fact, if the inventory swing were concentrated in a particular quarter, we could see fairly rapid growth for a brief period. Regardless of the precise timing, there are a number of factors which suggest that the pace of recovery will be considerably slower than usual. In particular, I expect that consumption—which accounts for about 70 percent of gross domestic product—is likely to grow slowly for three reasons. First, real income growth will probably be weak by historical standards. There were a number of special factors that boosted real income in the first half of the year, helping to offset a sharp drop in hours worked and very sluggish hourly wage gains. These factors included the sharp drop in gasoline and natural gas prices; the large cost-of-living-allowance increase for Social Security recipients reflecting last year’s high headline inflation; a sharp drop in final tax settlements; a reduction in withholding tax rates; and a one-time payment to Social Security recipients. These factors provided a transitory boost to real incomes, which will be absent during the second half of the year. As a result, real disposable income is likely to decline modestly over this period. Second, households are still adjusting to the sharp drop in net worth caused by the persistent decline in home prices and last year’s fall in equity prices. This suggests that the desired saving rate will not decline sharply. That means consumer spending is unlikely to rise much faster than income. In other words, weak income growth will be an effective constraint on the pace of consumer spending. Moreover, some sectors such as business fixed investment in structures are likely to continue to weaken as existing projects are completed. In an environment in which vacancy rates are high and climbing, prices are falling, and credit for new projects is virtually nonexistent, this sector is likely to be a significant drag on the economy over the next year. Perhaps most important, the normal cyclical dynamic in which housing, consumer durable goods purchases and investment spending rebound in response to monetary easing is unlikely to be as powerful in this episode as during a typical economic recovery. The financial system is still in the middle of a prolonged adjustment process. Banks and other financial institutions are working their way through large credit losses and the securitization markets are recovering only slowly. This means that credit availability will be constrained for some time to come and this will serve to limit the pace of recovery. If the recovery does, in fact, turn out to be lackluster, the unemployment rate is likely to remain elevated and capacity utilization rates unusually low for some time to come. This suggests that inflation will be quiescent. For all these reasons, concern about “when” the Fed will exit from its current accommodative monetary policy stance is, in my view, very premature. The rest of the speech is on the "how" of unwinding current policy and is worth reading. Note: Usually the NY Fed president is one of the most powerful Fed voices and has a permanent seat on the FOMC (the other Fed presidents serve on a rotating basis). What if I wrote that U.S. payroll employment increased by 383 thousand jobs in May 2009 following an increase of 259 thousand jobs in April 2009? Some readers would suspect CR had been captured by aliens or had visited crazytown. But, in fact, those numbers are exactly what the BLS reported as the actual change in payroll employment in April and May. The economy added 643 thousand jobs over those two months. However no one reports those numbers because there is a strong seasonal pattern to employment. Even in the best of years, 2.5 to 3.0 million people lose their jobs in January. It happens every year for a number of reasons such as retail cutting back on holiday hires. And just about every July the economy loses over 1 million jobs for seasonal reasons too. 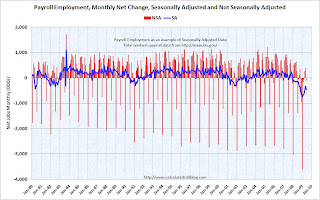 The blue line is the seasonally adjusted (SA) change in net jobs as reported by the BLS, and the red columns are the actual not seasonally adjusted (NSA) data. No one reports the NSA data because the swings are so wild and the pattern very consistent. Unless you follow the data closely, the NSA numbers are meaningless. The model used by the BLS for seasonal adjustments is very good, and the SA number is the one to use. For new home sales there is a strong seasonal pattern too, but in this case I think it is helpful to look at both the NSA and SA data. 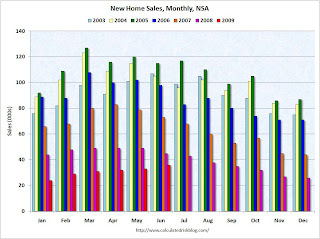 Here is how I present monthly new home sales (NSA - Not Seasonally Adjusted). This shows the seasonal pattern (Spring buying season), and it is easy to compare the pattern for the current year to the previous years. Of course, for new home sales, I lead with the headline SA data. And that brings us to the Case-Shiller data. 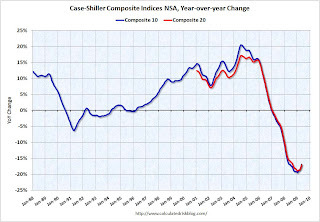 Yesterday I posted the following graph of the month-to-month change of the Case-Shiller index for both the NSA and SA data (annualized). Note that Case-Shiller uses a three-month moving average to smooth the data. 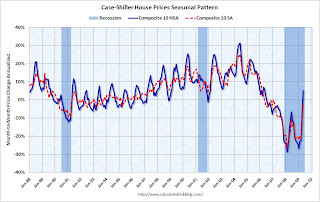 The Blue line is the NSA data and there is a clear seasonal pattern for house prices. The red dashed line is the SA data as provided by Case-Shiller. For this pattern, I'd expect the SA dashed line to run between the peaks and troughs as it did in the '90s. However look at the last couple of years. The SA dashed line is very close to the NSA line, even with the wild NSA swings. This suggests to me that the seasonal adjustment is currently insufficient and I expect that the index will show steeper declines, especially starting in October and November. Even with the wild NSA swings, most media reports used the NSA data and not the SA data (Streitfeld at the NY Times used both). After a plunge lasting three years, houses have finally become cheap enough to lure buyers. That, in turn, is stabilizing prices, generating hope that the real estate market is beginning to recover. Now this is the same news as yesterday, but I just want to point out the widespread reporting of a possible bottom in housing prices. And because of the way Case-Shiller is constructed (with a three month moving average) there is a good chance prices will look positive for the June report too (to be released in August). Streitfeld has been writing about the housing bubble and collapse for years. The Atlantic named him "The Bard of the Bubble" in 2006. Hong has only been covering housing for a couple of years, but he has also done a very good job. Of course I think house prices will continue to decline in the Fall, and that the May report was distorted by seasonal factors. The Obama administration, scrambling to get its main housing initiative on track, extracted a pledge from 25 mortgage company executives to improve their efforts to assist borrowers in danger of foreclosure. In an all-day series of meetings Tuesday at the Treasury Department, government officials reached a verbal agreement with the executives for a new goal of about 500,000 loan modifications by Nov. 1 and stressed the program's urgency. The sessions came amid concerns that the Obama administration will fall far short of its original goal of helping up to 3 million to 4 million troubled borrowers with modified loans. Counting the number of mods might make for useful PR, but some mods are more effective than others. A capitalization of missed payments and fees, along with a rate reduction and/or extended term, are the most common modifications. But for homeowners with significant negative equity that is just "extend and pretend" and leads to a high redefault rate and just postpones foreclosure. Why are so many homeowners underwater on their mortgages? Michael LaCour-Little, a finance professor at California State University at Fullerton, looked at 4,000 foreclosures in Southern California from 2006-08. He found that, at least in Southern California, borrowers who defaulted on their mortgages didn’t purchase their homes at the top of the market. Instead, the average acquisition was made in 2002 and many homes lost to foreclosure were bought in the 1990s. More than half of all borrowers who lost their homes had already refinanced at least once, and four out of five had a second mortgage. The conventional wisdom is that households who purchased at the top of the market during the recent housing bubble are those most at risk of default due to recent price declines, upward re-sets of adjustable rate mortgage instruments, the economic downturn, and other factors. 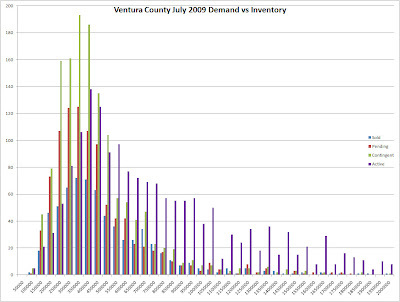 Here we use public record data to study Southern California borrowers facing foreclosure in late 2006 and 2007. We estimate property values at the time of the scheduled foreclosure sale with the automated valuation model of a major financial institution and then track actual sales prices for those properties that actually sold, either at auction or as later as REO. We find that virtually all of the borrowers had taken large amounts of equity out of the property through refinancing and/or junior lien borrowing with total cash extracted exceeding $300 million. As a result, losses to lenders exceed those of borrowers by a substantial margin, calling into question policies aimed at protecting borrowers. It may seem unfair that these homeowners receive help from the bank (or from the government), but as far as slowing foreclosures it really doesn't matter why the homeowner is underwater. I think the research from the Boston Fed suggesting the costs of foreclosure are less than the costs of modifications is a stronger argument against many mods. Sam Zell started by saying we need to separate commercial from residential. Commercial will be fine in his view (not my view). Also Zell thinks losses are overstated for investment banks and CDOs. Zell isn't talking about new construction (CRE), rather he is talking about prices for existing CRE. He feels there is too much global demand ("liquidity") for prices to fall too far - especially for Class-A buildings. A little over a year later several Class-A owners are just walking away. After posting three straight months of positive data, the residential real estate market has reached an equilibrium where prices will stop falling, said Sam Zell, founder and chairman of Equity Group Investments. This, in turn, will spark stabilization throughout the rest of the economy. If single family housing starts and new home sales have found a bottom, then that will remove a key drag from the economy and employment. That is a positive. But I think Zell is wrong on house prices. I think the pace of declines will slow, but that there will be a long tail for real prices. I could be wrong ... and I think different areas will bottom at different times, and some lower priced areas with heavy foreclosure activity might be at or near a bottom (same with some non-bubble areas). But in general, I think prices will fall further. First, if I've let a little hubris slip into my recent posts, I apologize. My goal is to be the most humble blogger in the world (an old joke). Second, I am not an investment advisor and I do not offer investment advice. I try to provide some hopefully useful data with sources - especially concerning real estate - and then add my own analysis. Nothing here is intended as investment advice. Please keep the above in mind ... and although I rarely discuss investing, I'd like to quickly explain why I went mostly long in my own portfolio in late February and early March. Several readers can vouch for my change in view (like Brian and Michael). I only share my investment ideas with people I know - and who I know are responsible for their own actions. Sentiment in February and March was for a Great Depression II, and it was clear to me that several key indicators were about to change: auto sales, single family starts and new home sales were three I mentioned frequently on this blog. I figured when that data changed, the sentiment would change. Buying at the time was difficult. 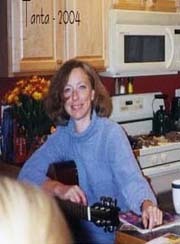 And yes, I'm still long (although that could change at any time, and I will not disclose it). The reason I bring this up is the Case-Shiller report today really bothered me. To be more accurate, the reporting on the Case-Shiller report bothers me. As I mentioned earlier today, there is a strong seasonal component to house prices, and although the seasonally adjusted Case-Shiller index was down (Case-Shiller was reported as up by the media) - I don't think the seasonal factor accurately captures the recent swings in the NSA data. I have no crystal ball - and maybe prices have bottomed - but this potentially means a negative surprise for the market later this year - perhaps when the October or November Case-Shiller data is released (October will be released near the end of December). If exuberance builds about house prices, and the market receives a negative surprise, be careful. Just something to watch later this year (I will post about house prices, but I will not mention the possible impact on the stock market in future posts). The Case-Shiller index of home prices in 20 metropolitan areas, produced by Standard & Poor's, rose 0.5% in May from the month before, the first increase after 34 straight months of decline. No mention that they are using the NSA data. And this would be a weird housing cycle if residential investment and house prices bottomed at almost the same time. See: Housing: Remember the Two Bottoms! If there’s one indicator that investors are likely to embrace as their yardstick for the housing market predicament it is the Case-Shiller home price index. This is the index that turned lower in 2006, presaging the eruption of the credit crisis. Its apparent stabilization hence marks a turn in the housing dilemma. Although a plethora of data have pointed to stabilization in housing of late, only the Case-Shiller index has the power to sway doubters, chiefly because it captures trends in the subprime mortgage market better than other indicators. Like I said, I could be wrong about prices ... but this is the kind of information that is being disseminated by the MSM, and that means a negative surprise is possible. Not to just pick on the MSM reporting. I was sent (by several readers) a housing analysis yesterday. It was some sort of weird mash up between the excellent David Rosenberg and some blogger. The charts are great, but the analysis is sometimes inaccurate. The "research" made comments like this for the NAHB HMI: “Sales outlook is stuck at 26, and anything under 50 is a contraction”. Not correct. The NAHB index is a sentiment indicator and doesn’t indicate contraction. Any number under 50 indicates more builders view sales as poor than good. See this chart - the index moves with new home sales and housing starts. And another example: "Architectural billings Index slipped five points last month to 37.7 - a sign residential construction is just bouncing along bottom". The ABI is primarily for non-residential construction. Hines and Sterling American Property decided to transfer their interest in 333 Bush St. to the original financers, following the surprise dissolution of law firm Heller Ehrman in September ... The 118-year-old law firm defaulted on its 250,000-square-foot lease, leaving the nearly 550,000-square-foot property 65 percent vacant. ... Hines and Sterling bought the tower for $281 million in 2007, near the top of the market, when it was 75 percent leased. Probably another half off sale (or worse) coming up. It is amazing that 75% of downtown San Francisco Class A office building were sold between 2005 and 2007. [T]he normal dynamics of the business cycle are turning more favorable. Some sectors are poised to rebound simply because they have sunk so low. For example, the auto industry has cut production so far that inventories have begun to shrink, even in the face of historically weak demand. Just slowing the pace of inventory liquidation will bolster economic activity. This story holds for many sectors of the economy where spikes in inventories occurred as cautious consumers cut back on purchases of durable goods, and businesses slashed spending on equipment and software. Looking forward, the demand for houses and durables should also eventually revive as old and broken-down goods need to be replaced. The resulting demand will help the economy recover. But that recovery is likely to be painfully slow. History teaches that it often takes a long while to recover from downturns caused by financial crises. Financial institutions and markets won’t heal overnight. And it will take quite some time before households have repaired their tattered finances. Until recently, households were saving less and borrowing more in response to wealth gains in both stocks and housing. This pattern made their balance sheets vulnerable to adverse developments and the crashes in both house and stock prices during the last two years destroyed trillions of dollars of their wealth. Not surprisingly, the personal saving rate has now shot higher and I expect to see subdued consumer spending for some time. The unprecedented global nature of the recession also will act as a drag. Countries recovering from financial crises often receive a boost from foreign demand, but neither the United States nor its trading partners can count on such external stimulus this time. A gradual recovery means that things won’t feel very good for some time to come. The unemployment rate currently is 9½ percent, and this figure is likely to rise further. Moreover, even after the economy begins to grow, it could still take several years to return to full employment. The same is true for capacity utilization in manufacturing, which has declined so far that it has fallen “off the charts”—now standing at its lowest level in the postwar period. Now let me turn to the business environment facing banks. The industry is going through one of the most difficult periods in modern times. ... Bank profits are down, loan delinquencies are up, and failures are climbing. ... Recessionary effects normally take some time to work their way through loan portfolios. So, even though I expect economic growth to resume in the second half of this year, banking conditions are likely to remain quite weak for another year or two. To date, the community banks under greatest financial stress are those with high real estate concentrations in construction and land development lending. Banks that liberally funded speculative housing and condominium construction, and those that funded land acquisition and development, have been hardest hit. Over 20 District financial institutions have failed since last year. The vast majority of them had high concentrations in residential construction and development lending. In fact, these banks had construction loans that averaged about 40 percent of their loan portfolio, well above the District average of 16 percent. Unfortunately, some banks that aggressively pursued these loans had weak appraisal and risk-monitoring systems. The next area of significant vulnerability for the banking system, particularly for community and regional banks with real estate concentrations, is income-producing office, warehouse, and retail commercial property. Market fundamentals in most western states are deteriorating. Vacancy rates are rising and rent pressures are hurting property cash flows. Office vacancy rates in both Boise and Portland are expected to reach or exceed 20 percent over the next year or two, the highest rates these cities have seen in many years. Retail shopping centers are struggling with falling occupancy rates and pressures to grant rent concessions. Property values are falling sharply across wide areas of the country, including the Pacific Northwest. Some analysts forecast that commercial property values could experience falls similar to housing of 30 to 40 percent. Our biggest concern now is with maturing loans on depreciated commercial properties. In many cases, borrowers seeking to refinance will be expected to provide additional equity and to have underwriting and pricing adjusted to reflect current market conditions. In some cases, borrowers won’t have the resources to refinance loans. Case-Shiller released the May house price index this morning, and most news reports focused on the small increase, not seasonally adjusted (NSA), from April to May. As I noted earlier, the seasonally adjusted (SA) data showed a small price decline from April to May. Case-Shiller reported that prices fell at a 2.5% annual rate in May (SA). However I think the seasonal factor might be insufficient during the current period. 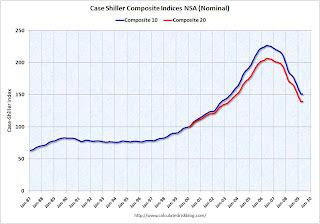 The following graph shows the month-to-month change of the Case-Shiller index for both the NSA and SA data (annualized). Note that Case-Shiller uses a three-month moving average to smooth the data. The Blue line is the NSA data. There is a clear seasonal pattern for house prices. The seasonal adjustment appears pretty good in the '90s, but it appears insufficient now. I expect that the index will show steeper declines, especially starting in October and November. The second graph compares the Case-Shiller Composite 10 SA index with the Stress Test scenarios from the Treasury (stress test data is estimated from quarterly forecasts). NOTE: I'm now using the Seasonally Adjusted (SA) composite 10 series. Edit correction: All data for May. So far house prices are tracking the baseline scenario, but I believe the seasonal adjustment is insufficient and prices will decline faster in the Fall. Just a note to the previous post. Case-Shiller has released the Seasonally Adjusted house price index. Prices fell slightly in May (compared to April) for the Composite 10 and Composite 20 indexes. 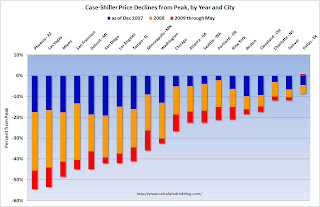 Seasonally adjusted, prices fell in 12 of the 20 Case Shiller cities. There is a strong seasonal pattern to house prices, and it is important to use the SA data. Unfortunately Case-Shiller did not release the SA data earlier this morning. This has lead to numerous incorrect headlines about prices increasing from April to May. That is correct, if they mention the data is Not Seasonally Adjusted. Important Note: Case-Shiller hasn't released the Seasonally Adjusted data yet for May. There is a strong seasonal pattern for prices and this is the NSA data. S&P/Case-Shiller released their monthly Home Price Indices for May this morning. This monthly data includes prices for 20 individual cities, and two composite indices (10 cities and 20 cities). Note: This is not the quarterly national index. The Composite 10 index is off 33.3% from the peak, and up slightly in May. The Composite 20 index is off 32.3% from the peak, and up slightly in May. NOTE: This is the NSA data, prices probably fell using the SA data. The Composite 10 is off 16.8% over the last year. The Composite 20 is off 17.1% over the last year. This is still a very strong YoY decline. Prices increased (NSA) in 14 of the 20 Case-Shiller cities in May. In Phoenix, house prices have declined 54.5% from the peak. At the other end of the spectrum, prices in Dallas are only off about 8% from the peak. Prices have declined by double digits almost everywhere. 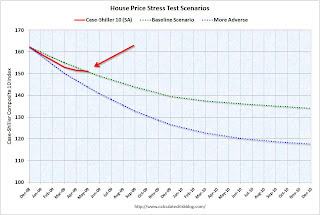 I'll compare house prices to the stress test scenarios soon. If the option is foreclosure or modification - and the modification will work, then the economics favor foreclosure. The problem is it is hard to tell if the borrowers will self-cure or redefault. Lenders also worry that borrowers may re-default even after receiving a loan modification. This only delays foreclosure, which can be costly to the lender because housing prices are falling throughout the country and the home's condition may deteriorate if the owner isn't maintaining it. In some cases, lenders lose twice as much foreclosing on a home as they did two years ago, said Laurie Goodman, senior managing director at Amherst Securities. When you compare the losses from foreclosure to the losses from modifications - and include self-cure risk and redefault risk - the researchers argue there are very few preventable foreclosures. An Obama administration effort to reduce home foreclosures by lowering the mortgage payments of struggling borrowers before they fall behind is failing to help as many people as expected. Among the problems: Some homeowners are being told they must be behind on their payments to receive help, which runs counter to the aim of the program. In other cases, delays are so long that borrowers who are current on their payments when they ask for a loan modification are delinquent by the time they receive one. There is also confusion about who qualifies. Administration officials have summoned executives of 25 mortgage-servicing companies to Washington on Tuesday to discuss efforts to help borrowers, both delinquent and at risk. 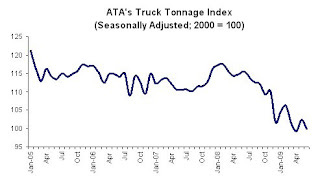 Compared with June 2008, tonnage fell 13.6 percent, which surpassed May’s 11 percent year-over-year drop. June’s contraction was the largest year-over-year decrease of the current cycle, exceeding the 13.2 percent drop in April. Trucking serves as a barometer of the U.S. economy, representing nearly 69 percent of tonnage carried by all modes of domestic freight transportation, including manufactured and retail goods. Trucks hauled 10.2 billion tons of freight in 2008. Motor carriers collected $660.3 billion, or 83.1 percent of total revenue earned by all transport modes. Real estate agents say they have never seen prices drop so precipitously when dealing with opulent, often empty high-end homes along the North Shore ... "It is a phenomenon we've never seen in our lifetime," said real estate agent Jason Hartong with Rubloff Residential Properties, who has seen some multimillion-dollar price tags cut nearly in half. Developers, many now in bankruptcy, were caught by surprise, as well. Vacant and unfinished homes dot the Chicago suburbs, with for sale signs that tout the "New Price." For instance, a custom-built stone home at 750 Sheridan Rd. in Winnetka priced at $5.5 million in November 2007 is going for $3.3 million. The problems are movin' on up the value chain. The good news, according to a Barclays Capital report, is not as many Option ARMs will recast in 2011 as forecast earlier by Credit Suisse. The bad news is borrowers are defaulting en masse before the recast. The wave of “option” adjustable- rate mortgages recasting to higher payments, projected by some economists to represent a looming source of foreclosures that will hurt housing markets over the next few years, will be smaller “than feared” because many borrowers will default before their bills change, Barclays Capital analysts said. “The additional risk really will only be for borrowers who manage to stay current over the next couple of years and might default due to a payment shock,” the New York-based analysts including Sandeep Bordian and Jasraj Vaidya wrote. Also some of the loans (mostly Wells Fargo) will probably recast later than the Credit Suisse chart. This suggests the recast related problems will happen sooner than the Credit Suisse chart suggests. That is good news in that the problems might not linger as long, and also suggests further price pressure in the short term for the mid-to-high end areas with significant Option ARM activity. First, not all option ARM portfolios are alike and we believe we have the best portfolio in the industry. While recently reported industry data, as of April 2009, indicates 37 percent of all industry option ARM loans are at least 60 days past due, our portfolio is performing significantly better with only 18 percent 60 days or more past due as of June 30. Not surprisingly, our non-impaired portfolio is performing significantly better than our impaired portfolio with only 4.7 percent 60 days or more past due. In fact, 92 percent of the non-impaired portfolio is current, compared with 62 percent of the impaired portfolio. In addition, while many other option ARM loans have recast periods as short as five years, our Pick-a-Pay loans generally have ten-year contractual recasts. As a result, we have virtually no loans where the terms recast over the next three years, allowing us more time to work with borrowers as they weather the current economic downturn.